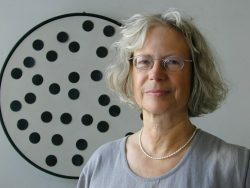 Antje von Graevenitz, now retired and living in Amsterdam was born in 1940 in Hamburg. Specialized in the history of 20th- and 21st-century art, she firstly as a lecturer taught at the University of Amsterdam (1977-1989) and secondly as a professor at the University in Cologne (1989-2005). Parallel to studying librarianship (diploma in 1964), she read art history at Hamburg and Munich, where in 1973 she obtained her PhD with her dissertation about the Dutch ornament in the lobate-style (‚kwab’). In 1971 she started writing art reviews for the Süddeutsche Zeitung and in 1975 working in editorial boards (Museumjournaal, Wonen + TABK, Kunstschrift OKB, Vrij Nederland, Archis and Wallraf-Richartz-Jahrbuch) and has published widely in books, museum catalogues and art journals. In her research she is mainly focused on ephemeral art and interdisciplinary and anthropological art-topics in relation to rites of passage, philosophy, music and theatre. Some of her publications are dedicated to Marcel Duchamp, Joseph Beuys and Nam June Paik.